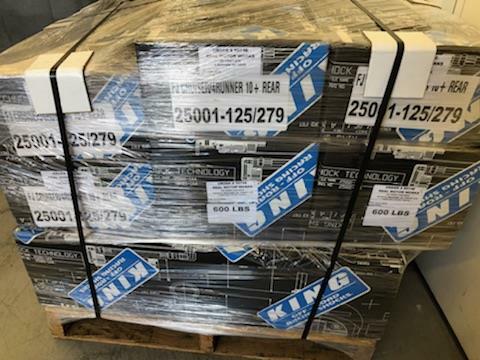 King’s new line of Original equipment manufacturer, (OEM), shock upgrade kits provide a bolt on suspension system that elevates your on and off-road performance to unmatched levels. Each kit has been subjected to punishing real world testing to develop the optimal damping curves and spring rates for your vehicle. Built with the same quality of materials and precise tolerances found on our high end race shocks our OEM upgrade kits enable you to experience the famous King ride quality on your daily driver or prerunner. Built with race winning design features our kits come complete and provide simple 100% bolt on installation with no cutting or welding done to your vehicle. Our front kits provide an adjustable ride height and up to a 25% increase in wheel travel. Rear kits typically allow a 15% travel increase. Large 2.5” diameter shock bodies and external reservoirs dramatically increase fluid capacity and heat dissipation to provide sustained damping performance even under the most punishing conditions. 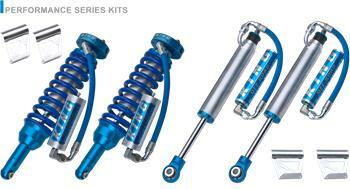 Our OEM upgrade shocks feature the same serviceable design that allows for valve adjustments with simple hand tools just like our race shocks.